NASHVILLE, TN (CelebrityAccess) — Country vocal and gospel quartet The Oak Ridge Boys have been presented with the Bob Hope Award for Excellence in Entertainment by the Congressional Medal of Honor Society – recognizing their work with The American Legion. The group accepted the award on August 8 at the Nashville Salutes Gala surrounded by 25 Medal of Honor recipients. 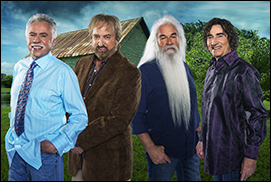 In September 2014, The Oak Ridge Boys joined forces with The American Legion to help raise awareness and support for better detection and treatment of post-traumatic stress disorder among U.S. military servicemen and women, and veterans. Through the partnership, The Oak Ridge Boys have also assisted with improving the VA benefits process, as well as the education and career opportunities that are available to veterans once they return to civilian life.